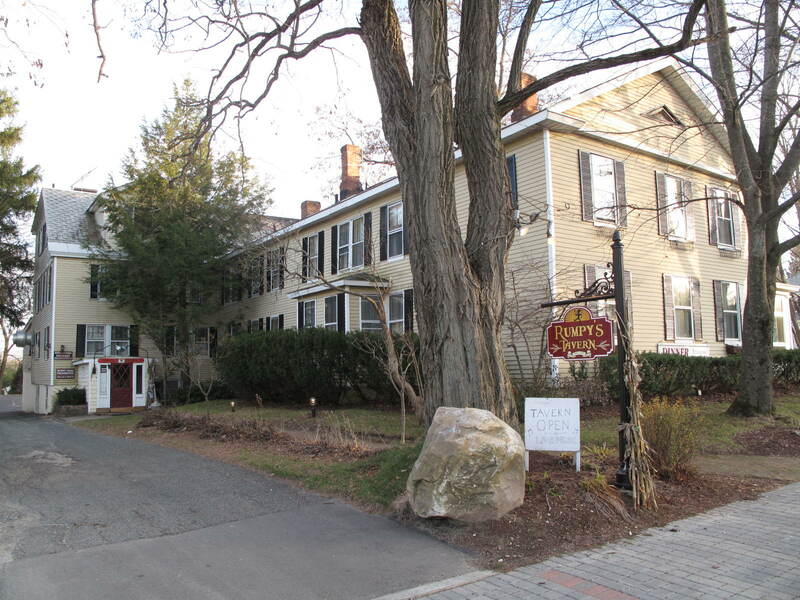 This Colonial Revival style building has two stories, a slate roof and has been significantly altered. It is a wood frame and originally a three-bay front façade facing street with front gable roof (indicated by spacing of windows on front facade), and cornice returns. It has 4 brick chimneys and intact 2-over-2 windows. A large 2-story rear addition extends to both right and left of original house with broken-eave gabled wall dormer on the front of the right section. There are two 2-story faceted bay windows on the right side and a 1-story box bay window on the left side. There is a triangular attic window in the front gable. Originally a simple farmhouse, this building has been altered and enlarged many times. The late-Victorian renovations are the most clearly visible elements of the structure, although the restrained nature of the detailing has preserved a Federal quality. The origin of the rear portion can be seen in its barn-like form. The original two-room structure was the farmhouse of John Whitlock, an early settler in Lenox whose farmlands occupied much of what became Lenox Village. In the late 1770’s Whitlock opened his house as an inn following the pattern of many Berkshire householders who supplemented their farming income by providing lodging for stagecoach travelers. Whitlock sold off his farmland in the late 18th century including the land for what was to become Church Street, which was purchased by the Town in 1815. In 1821 the house and lot was purchased by Lemuel Parsons for $105.00. Mr. Parsons, a wagon-maker returned it to use as a private home. Around 1890 Graham Root purchased the property and greatly enlarged the house by attaching two barns. He then opened the house once again as an inn which was officially named “The Graham Root Inn”. But the Inn was generally known as the Grey House. Property was purchased by the Rudisill Maintenance Trust in 1983 and by Bennington Bear Inc. in 2004. Today it operates as the Village Inn.